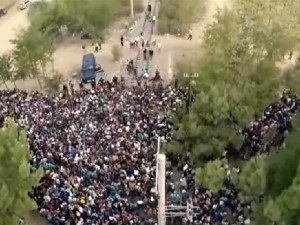 ‘With Open Gates: The forced collective suicide of European nations’, a slick, hard-hitting film about the European migrant crisis is going viral in Europe, already watched a half a million times. Although the 19-minute film may feel like a dispatch from the future, it is cut entirely from recent news reports, police camera footage, and interviews. Kicking off with scenes of a modern car ferry disgorging thousands of illegals into Greece, the film then cuts to dozens of aerial shots of columns of migrants marching north into Europe. The film then changed to the harrowing testimony of one young Greek woman who was unable to hide her horror and despair at the scale of the migrant crisis sweeping over her home island of Lesbos. Just six miles from the Turkish coast, the island was subjected to migrant riots in September as newcomers turned on their hosts for not moving them to mainland Europe fast enough. As Breitbart London reported at the time, the tearful woman tells a news crew: “We are in danger, every day, every minute. We need someone to protect us. They come into our houses. I want to go to work, but I can’t. Our children want to go to school, but they can’t. They have stolen our lives!”.